Sofia Sakorafa is a Greek former javelin thrower. Sakorafa was born in Trikala, Thessaly, on April 29, 1957. She started competing in athletics at age 15 as a member of Trikala Gymnastic Club. On September 25, 1982, Sakorafa broke the world record in the javelin with a throw of 74.20m which stood as a Greek record until the new javelin was introduced. 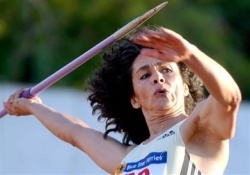 In total, Sakorafa - often pushed by her antagonism with Anna Verouli - broke the Greek record for the javelin 17 times. Sakorafa is currently a physical education teacher. Besides athletics, she is also a politicial activist and has espoused several causes in her lifetime including world peace, women's rights, Palestinian rights, etc. Sakorafa has served on the City Councils of Athens and Maroussi. She also nearly won a seat in the Hellenic Parliament under the banner of PASOK. 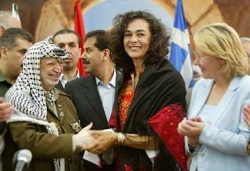 Sofia Sakorafa, stirred controversy in 2004 when she became a Palestinian citizen and applied at the last minute for a berth on the Olympic team. She made her debut as a Palestinian athlete in Chania, Crete, on June 28, 2004. The international governing body of Athletics ruled her ineligible for the Olympics - Sakorafa’s recent throws were well below the minimum standards. This page was last edited on November 22, 2018, at 21:17.